When I moved to Ireland three and a half years ago, one of the first things I wanted to do was learn the sport of hurling. I’ve been fascinated by it ever since seeing it 31 years ago, on my first visit to Ireland. It struck me as one of the fastest, most skilled and toughest games in the world. This past spring, I finally had the opportunity to play in a match with friends from Kilkenny. Having grown up playing lacrosse in Manhasset, Long Island (possibly the world capital of high school lacrosse), and playing in college, I thought I’d have an easy time picking up Ireland's famous sport. A group of friends in the O’Loughlin’s Hurling Club in Kilkenny invited me to play in a “club" level match (Kilkenny is a Hurling stronghold, and home to the all-Ireland champion Killkenny “Cats"), and I practiced until I felt I wouldn’t be a complete waste of space for the team. At long last in my first match, I attempted to score with a beautifully executed toss and swing. I crushed the air, but failed to make contact with the ball! (It turned out to be my only scoring attempt of the day). I did manage to make a pass to my friend, who converted for a goal. After an hour or so, I was growing frustrated with my lack of scoring production. I went straight for an opponent, shouldering him in an attempt to get possession of the ball. I never gained possession, but I did manage to get his hurl (stick) broken over my head. Fortunately, I was wearing a helmet. My first match showed me that, as in lacrosse, it takes years of practice and playing before you see results in hurling. After my less than steller debut, I had dinner at a local restaurant with my teammates, who subjected me to a good deal of ribbing – all of it good-natured. To my surprise, the next morning at a restaurant, a coach from O’Loughlin’s Club recognized me and asked if I was planning to join the club full-time. This certainly helped the ego. It didn’t change the way my body felt as a result of the match, however. For a good week afterwards, I was so sore that walking was done only with a good deal of difficulty. With its origins pre-dating recorded history, hurling is, arguably, the oldest field game on earth. This author would contend that lacrosse is just as old, but let us leave that battle for another day. The first accounts of Hurling describe the sport as a type of warfare, through which disputes between neighboring clans were settled. The first mention of the game is taken from a description of the Battle of Moytura fought around 1270-1272 B.C. Legend says that when The Fir Bolg battled Tuatha De Danaan, they played hurling until their bones were broken and they fell outstretched on the earth. Then the victors fell upon their opponents and slew them. The first written record of hurling is found in the Brehon Laws of the 5th century, which allowed for compensation to the family of persons killed in a hurling competition. Historians believe the game originated in Egypt, was brought to Ireland by the once nomadic Celts, and is the forerunner and inspiration for field hockey, ice hockey, and a little-known game called golf. This stick and ball game is played on a rectangular pitch (field) approximately 140 yards long by 70 yards wide. Fifteen players comprise a team: 1 goalkeeper, 3 fullbacks, 3 halfbacks, 2 midfielders, 3 forwards and 3 full forwards. The object is to drive the ball, called a sliothar (slit-or), into the opponent's goal, or above it for a point. 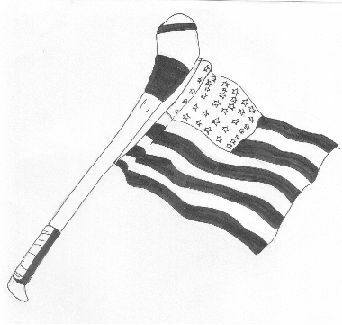 This is done with a wooden stick approximately 3-3 1/2 feet long called a hurl or hurley, made from solid ash wood. It has a wide spot on top called the “boss," for hitting and for ''soloing'' – carrying a round ball on a flat piece of wood while running (very tough to learn!). The sliothar is made from tightly wrapped twine covered in leather. It’s slightly smaller and softer than a baseball. Goals are H shaped with a soccer type net below the crossbar. Points (1 point each) are scored by hitting the slothar between the crossbar over the net, while goals (3 points each) are scored by hitting the sliothar past the keeper and into the net. It’s a relatively high-scoring game, not unlike lacrosse, where an average game score is about 18 – 12, with each team getting 2 - 4 goals and the rest in points. The overall roughness of the game, I’ve found, is comparable to lacrosse. Most of the contact in hurling occurs while competing for ball possession. There is no full-body checking allowed like one sees in ice hockey. Many players wear helmets nowadays. But other than that, there is no protective gear. Players can raise the sliothar off the ground only with their hurls, and are permitted to carry it in hand for a maximum of 4 steps. Then the player must return the sliothar to the hurl and carry it briefly before catching it in hand for another 4 steps. Players can only carry the sliothar 2 times for any one possession. As complex as this sounds, the game moves at lightning speed with the sliothar being hurled from one end of the pitch to the other in a matter of seconds. Every year, men from all over Ireland, of varying ages and skill levels, still participate in the age-old tradition of hurling. While the best hurling in the world is played at senior inter-county championship level, very competitive matches are also found on the local club level, fueled by long-standing local rivalries. Even at the highest levels, men play mainly for pride and honor. At the club level (where I played), they represent their local parish. The best are chosen to represent their county, a big honor. Players are not paid a salary, but the inter-county players give all their free time to training, resulting in a fitness level comparable to a professional soccer team. Strictly amateur! The players must live or work in the county they represent on the field. When Sunday matchday arrives, thousands of faithful supporters all over the country come out wearing their county colors to cheer their team. I wonder: Would baseball survive if the players were required to live and/or work all year in the communities they represent? I am a hurler in training. Most weekends I prefer to be a spectator, which is far kinder to my bones, though not as memorable as playing. The next time you’re in Ireland, try attending a match for a wonderful day out. For information on club and inter-county matches throughout Ireland, visit the GAA’s (Gaelic Athletic Association) website (www.gaa.ie) for times and venues. You can also have fun acquainting yourself with the history of the game by visiting The GAA museum at Croke Park in Dublin, aka "the headquarters." In recent years The GAA has expressed concern at the lack of participation in many counties throughout Ulster, Connacht, Leinster, and even parts of munster. But like Celtic / Gaelic culture, hurling has survived foreign invasion, British attempts to destroy its existence, famine, and the popularity of foreign culture and sport. Hurling shall prevail! Jeremiah Breen lives in Dublin.